While Microsoft got its start in desktop computer software, the company isn’t exactly a bit player in the online world. Microsoft’s Hotmail email service was hot long before Google entered the email game. Bing may be something of an also-ran in the search engine department, but it’s actually not bad at all (seriously, have you tried it lately?) And the Windows Live and SkyDrive services are also pretty impressive — offering 25GB of free disk space for documents, media, and other files. Synchronize your profile, app settings, and other data across multiple computers. Store your photos, documents, and files online so you can access them on any device with a supported web browser. 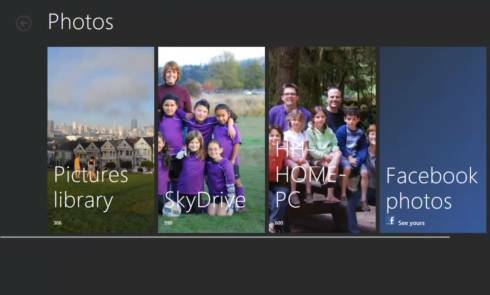 Third party developers will also be able to write to your SkyDrive account, saving files so they can be accessed on multiple devices. Microsoft’s Windows Live apps suite already blurs the lines between desktop and online apps, offering calendar, contact, photo, and other apps for a desktop computer that access your online data. Microsoft has given each of these apps a visual makeover with Windows 8, adding a Metro style user interface which is available when you’re using Calendar, Instant Messenger, or another app on a touchscreen device (or any device where you’d rather see the full-screen, finger-friendly user interface than the old school mouse-and-keyboard version). Apple is taking a similar approach to the cloud with the new iCloud service that will roll out with iOS 5 for iPhone, iPad, and iPod touch soon. Rather than simply backup all of your data online, iCloud will let you synchronize data between multiple devices. That includes everything from the apps and music you’ve purchased to your browser bookmarks. Google, on the other hand, has a slightly different vision* for the cloud. Rather than simply using online services to synchronize data across multiple devices, Google is pushing for a future where all of your data stays in the cloud — and you can simply access it from any device. Yes, Google’s Chrome OS operating system will grab your browser bookmarks and settings as soon as you login with your ID, but your music from the Google Music service streams over the internet — it’s not downloaded to your Chromebook. And instead of synchronizing data between calendar apps, contact apps, or other apps — you just open the web apps using your browser. Google is tweaking Google Docs, Gmail, and other services so that you can use them even when you don’t have an internet connection, but the apps are still designed to run in a web browser and if you don’t go online from time to time you won’t get the full benefit. It’s interesting to see how the three companies are taking three related, but different approaches toward integrating cloud-based services in their latest operating systems. * Google is actually taking two separate approaches. While Chrome OS is almost entirely a cloud-based operating systems, Google Android is designed to download and run native apps as well as web-based apps. In fact, while there’s no simple way to download songs from Google Music on a Chromebook (or Windows, Mac, or Linux computer), you can download songs on Android for offline listening since members of the Android team acknowledge that you might actually want to use your phone or tablet in situations where no internet connection is available.